Recent scientific investigations indicate insects are capable of becoming resistant to a variety of insecticidal agents, the most well-known being corn rootworm pyrethroid resistance in east central Nebraska. Larvae of the Diamondback and Indian meal moths show resistance to moderate levels of Bacillus thuriengensis (Bt) toxins, similar to the proteins expressed by transgenic corn plants (e.g., Yieldgard‚). The European corn borer (ECB) is a major corn pest in Iowa and the Midwestern United States. Any spread of potential resistance in field populations will depend on movement of moths between different locations. In the Midwest, two ECB ecotypes are present that differ in the number of generations (flights) per year: bivoltine (2 flights) and the more northern univoltine (one flight). 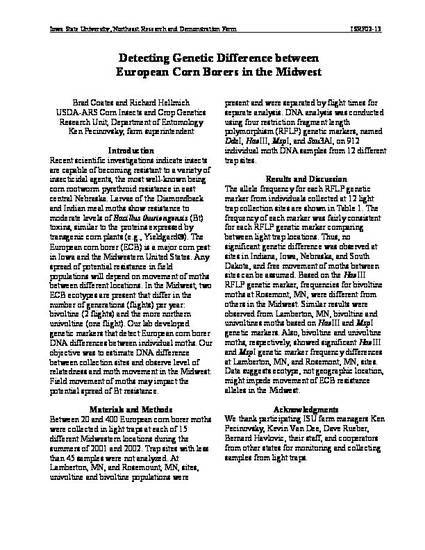 Our lab developed genetic markers that detect European corn borer DNA differences between individual moths. Our objective was to estimate DNA difference between collection sites and observe level of relatedness and moth movement in the Midwest. Field movement of moths may impact the potential spread of Bt resistance.